High quality, luxurious, hand-crafted, custom printed photo quilts. Design personalised quilts and create handmade heirloom and memory quilts with your own photos. We hand-stitch each one ensuring the highest quality finish for a stunning piece of art. The images are beautifully printed and preserved to make the finished piece look really special. Not only can they portray the family like a family tree quilt, but they are also perfect for handing down the family. The construction and build quality of our photo heirloom quilt is excellent, and with care they can easily last a hundred years. Photo quilts are a fun, decorative and practical piece of bedding that look and feel divine. Printed with your photos in a patchwork style or just printed all over with your designs, they breathe a new lease of life into your bedding. 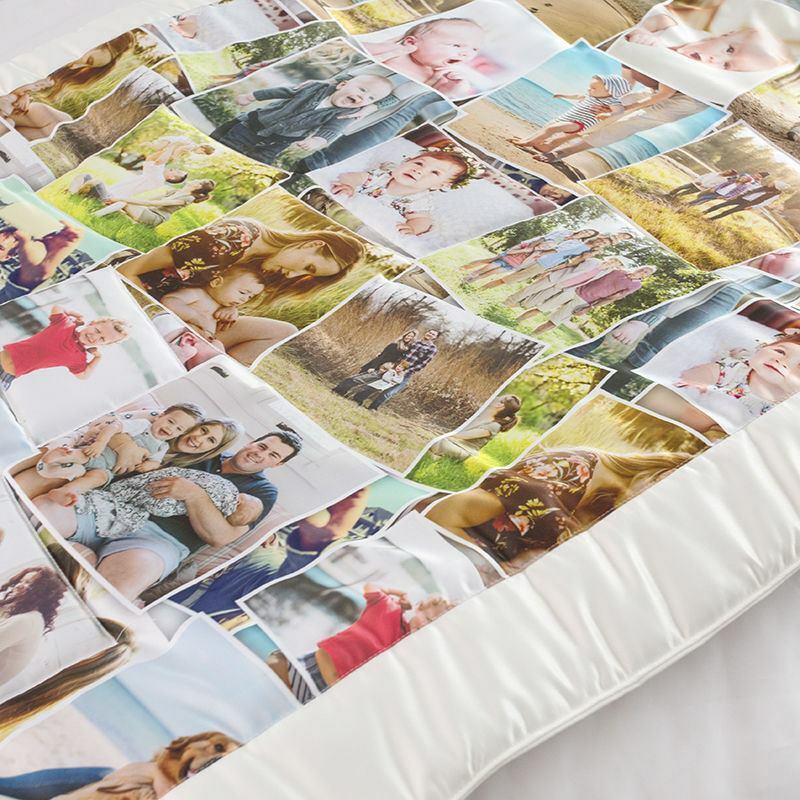 Made from luxury Duchess satin with soft, sumptuous padding inside, your photo quilts are expertly hand sewn to create an elegant personalised gift. Trust our years of experience to preserve your favourite photos in this quilt for life. The quilt i have designed was for my MIL as she is travelling next year in her camper-van and i thought what better way to make a quilt with pictures of her kids, in-laws and grandchildren to take with her. The quilt i received was just amazing and any queries I have were answered within a reasonable time frame and were very helpful. Also it arrived very quickly within 9 days and from overseas!!! just in time for Christmas. I can't wait to see her face when she opens it up. One very happy customer! I designed this quilt for my adult daughter's birthday in memory of her much loved grandmother who recently passed away. I ordered through the Australian website and then realised quilt was coming from England and was worried it would not arrive by her birthday. I was reassured that quilt would definitely arrive in plenty of time....and exactly one week after ordering quilt it arrived. Well done Bags of Love. The quilt exceeded my expectations with the photos being very clear, the workmanship excellent and the quality of the materials used exceptional. The colours of both material and photos was perfect. My daughter absolutely loves her memory quilt. Personalised photo quilts are handmade to order by our expert seamstresses. We print your designs onto a piece of Duchess satin fabric and print another piece with your chosen backing colour. We use a specialist printing process that fuses the ink to the satin fibres, so your designs won't fade, scratch off, or peel away. The print is striking with high definition finish. Thick, sumptuous padding is inserted before the two pieces are hand sewn together with mitred corners (to create the border), so your photo quilts are a real example of artisan craftsmanship. Care: Dry clean only. Do not put in washing machine or tumble dryer. Surface wash with mild soapy water and soft sponge. Treat well and it will last a lifetime. 10 year guarantee. Enjoying memories is one of life's wonderful experiences. One way to encapsulate memories into a featured item is to make this luxury quilt printed with your photos, art, and words to tell a story. Our memory photo quilts are made by Bags of Love's highly skilled print technicians and seamstresses, so your memory photo quilt will be handled with love and will be with you in days, to be handed down for years. We discovered from customers that this product has been a great help and comfort to families where family members have dementia, because the memories, printed as larger scale photos on their lap or bed, prompt people to recall events and family members. This has been viewed as helpful by the families who use the memory quilt as gift for people with Alzheimer's or dementia in this way. One of the many ways you can use our quilt is as a lap quilt. Absolutely perfect for Granny or Mum to sit with when they read, write, or watch TV. Sit with your nearest and dearest pictured on a lap quilt and keep comforted and warm at the same time. Our lap quilts are great gifts and the recipient more often than not is moved to tears, in the best possible way. They are especially popular as 70th and 80th birthday gifts for granny. An absolute classic, is make your own collage photo quilt. You can make the design any way you like combining photos, text, or other graphical elements that we custom print for you, to turn into the bespoke photo collage quilt, reminiscent of patchwork quilts. Press start design above and upload your photo selection, and our collage app will automatically generate a collage on your quilt. This is very easy to use and allows you to try out alternative versions before you buy. Another design idea is to create your own quilted photo memory wall hangings - something specifically hung up as wall art. The quilt itself is a piece of art, and hanging it on the wall is a tribute to its artistic value and the photo content printed on it. Portrait quilts on the wall with images of family, hung like tapestry or fabric wall art, has been happening for hundreds of years. 500 years and a digital revolution later, we put this ability in your hands. Have your photos made up into a photo memory wall quilt that you can display on the wall in your home. Make and design memory quilts and image eiderdowns right here with Bags of Love, and cover your wall in soft quilted glory.